Pluck mint and parsley leaves, then chop roughly. Mince garlic. Juice the lemon. Add the chopped herbs and garlic to a blender along with chickpeas, peas, lemon juice, tahini, ground cumin, salt, and water and blend until smooth. Heat oil in a grill pan over medium-high heat, add carrots and asparagus, and fry until slightly charred, approx. 7 min. Season with salt and pepper to taste. 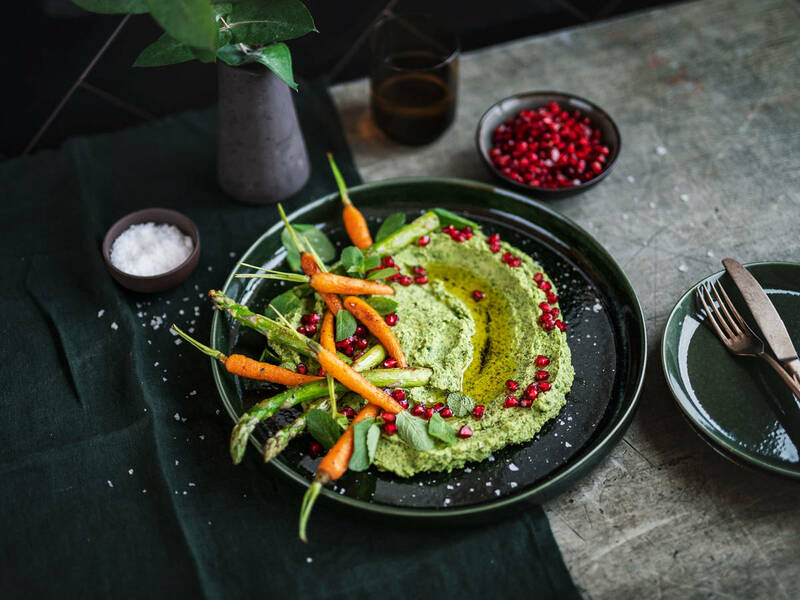 Add hummus to a serving plate, top with the charred carrots and asparagus, and garnish with pomegranate seeds and a drizzle of olive oil. Enjoy!